Ousted Egyptian president launches a tirade against his successor who he accuses of removing him in a "coup". 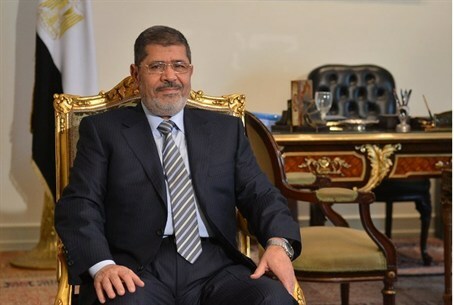 Ousted Egyptian president Mohammed Morsi on Sunday testified for the first time in his espionage trial, and launched a tirade against his successor whom he accused of removing him in a "coup", AFP reported. Morsi was toppled by former army chief and now President Abdel Fattah al-Sisi in July 2013 after mass protests demanding the Islamist's resignation after just one year in office. Appearing in a caged dock and dressed in white prison uniform, Morsi was fired up as he presented his own defense for the trial in which he stands accused of espionage along with 35 other people. "I am the president, and I have not been stripped off this title," Morsi said during his two-hour appearance in which he attacked Sisi several times without mentioning him by name. "On 3 July (2013), I was surprised by military chiefs suspending the constitution and toppling the president: if this is not a coup, then what is?" said the Muslim Brotherhood member, whose ouster was followed by a relentless crackdown on his supporters that left hundreds dead. Morsi also brushed off the authority of the court. "This court has no jurisdiction over me according to the law and the constitution. Gentlemen, you are not my judges and this is not my court," he told the three-member panel, according to AFP. Morsi accused Sisi of killing some of the roughly 800 protesters during the 2011 revolt that toppled long-time president Hosni Mubarak. He said that during his presidency investigators had recorded statements from hotel managers overlooking Tahrir Square, the epicenter of the 2011 protests, that "armed personnel from the entity headed by the leader of the coup (Sisi)" had shot demonstrators during the anti-Mubarak uprising. At the time, Sisi served as the chief of military intelligence. The espionage trial, in which prosecutors have asked for the death sentence, is one of several against the former Islamist president. In one trial he is being accused of inciting the killings of opposition protesters outside the presidential palace in December 2012.